Thoughts from a change instigator - in life and at work. This week, I'm in San Francisco, where the digital part of my media career began, and I found myself driving past the scenes of meetings past, slowing down as I passed the site of my office overlooking a garden, remembering the late nights and the conferences and the launch celebrations. And as a kind of thought experiment, I wondered what would have happened if I'd stayed in New York and magazine editorial, if I hadn't wanted to be part of the future of media instead of its past, and how different my life would be now. Or would it? After all, all media is digital media now, and those of us who went digital early have simply been thinking about its implications longer, and have gotten some good practice pushing for change rather than resisting it - an approach I associate with San Francisco rather than New York. I think my experiences on the West Coast got me hooked on and attuned to the new new thing, and I've since sought that out wherever I am. So as I sit at a borrowed desk looking out at where the bay was a few minutes ago and listening to a chorus of foghorns announcing its disappearance, I wonder what kind of change is next, and what part I can play in it? 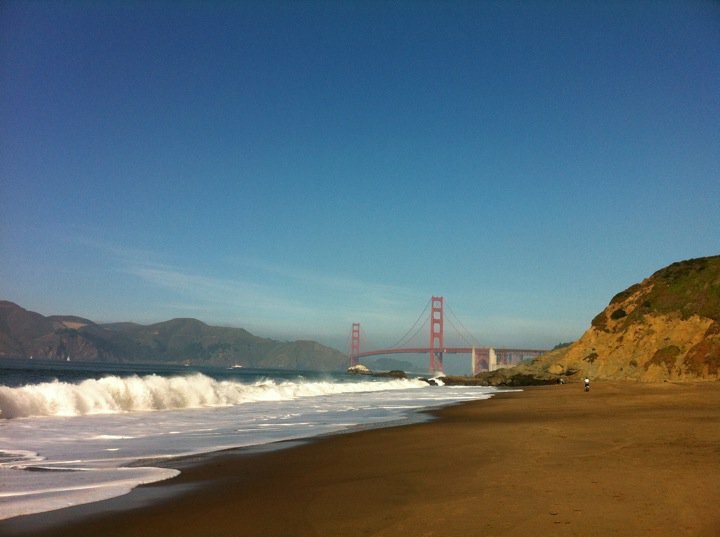 The Golden Gate Bridge from Baker Beach. I understand the pull of SF and West Coast thinking. I would contend you possess the poetry of both coasts.